Fly Paper: Belize: What is a Dedicated Permit Trip Like? Belize: What is a Dedicated Permit Trip Like? 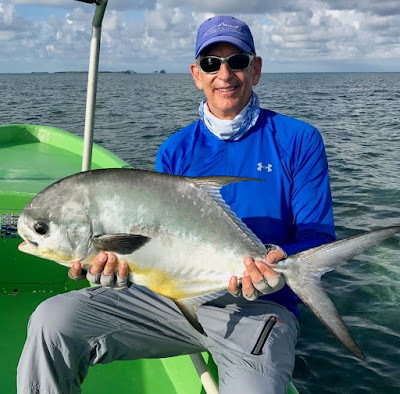 I am often asked the following question... usually by quite experienced anglers, "If I want to catch a permit, where should I go and how should I go about it?" Good question! There are many choices: Mexico in Ascension Bay, Espiritu Santo Bay or Chetumal Bay, Belize in the south or in Northern Belize at Ambergris Cay, or in the Bahamas at Crooked or Inagua Islands...or Cuba if you're really adventuresome. But the truth is, if you want to catch a permit, you first of all need to dedicate yourself to the process. Permit fishing is not a sidelight species as they are rarely found where bonefish and tarpon are found. Permit are rarely caught serendipitously. As one of my permit fanatic friends says "the juice has to be worth the squeeze... but you gotta squeeze the juice!" So if the best way to catch a permit is absolutely to commit, what can you expect from a dedicated permit trip if you do "go for it". Let's explore this question by looking at one of the best permit trips in the world and see if the obligatory frustration and dedication required dissuades you in any way. If one of the best permit trips in the world requires too much commitment from you, then should probably include the pursuit of other species into your trip itinerary. Maybe only plan to give permit a try for only one or two days. I think one of the best "dedicated" permit trips is aboard the Rising Tide in Belize. 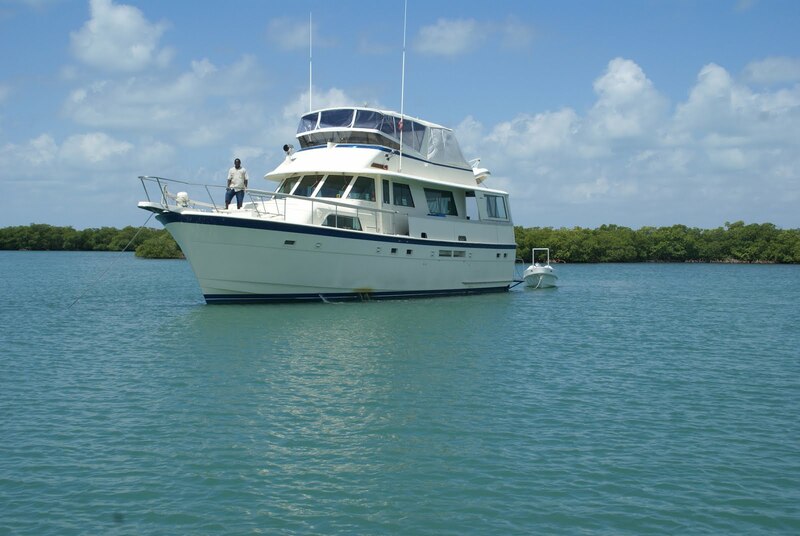 This live aboard yacht explores some of the finest permit flats on the globe which begin about 15 miles SE of Belize City and extend south from there for about 25 miles. The only practical way to access these outstanding flats is via a mothership... and we suggest the Rising Tide. But what makes this area so special? -First of all, the resident population of permit allows for more shots at tailing fish than almost anywhere we know. -Secondly, seldom do anglers fishing this area from the Rising Tide encounter another angler. That is because they are far enough away from the lodges and therefore these flats receive little pressure. It should be noted that these waters ARE permit waters; there are very few opportunities for bones or tarpon although some areas at times have schools of tarpon. There are “variety” Rising Tide agendas which fish other areas, but this particular trip should be considered a dedicated permit trip. As such, heading into this area should only be pursued by those experienced salt water fly fishers who understand how frustrating and exciting permit fishing can be. This is an area that some of the most successful permit fisherman come back to time and time again. 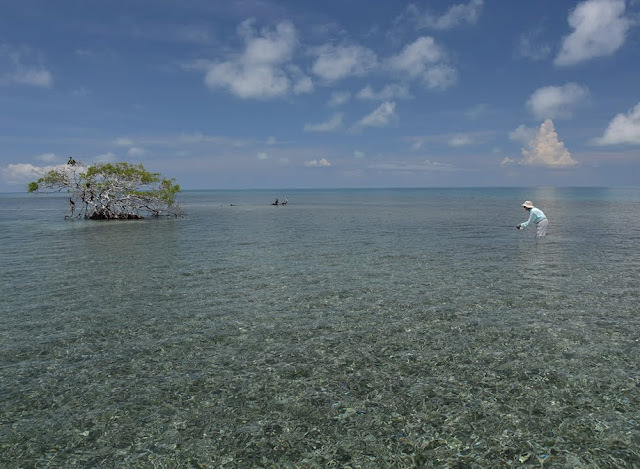 If you've chalked up double digit numbers of permit, you've no doubt not only heard of this area, but also probably fished southern Belize. For dedicated permit trips, consider building around a full or new moon because even though the tides in Belize only move inches of water (not feet) a few inches of water can make a difference on the shallow flats fished on this itinerary,. Here then is a trip report by Art Hinckley and two of his angling friends who have, for many years, taken two trips on the Rising Tide every year. Art has released over 120 permit. Art keeps a daily dairy of their trips. The attached report from his most recent trip in September will give anglers who understand permit fishing a sense of the flow of the fishing. On this trip, they released 11 permit. They do two trips a year, usually for 8 – 10 days and all they do is fish permit. Art and Dennis have taken over 170 permit between them – Chuck is new at permit and now has six from his two trips. For them, releasing 11 permit is a fairly average trip. Their record trip is 23 fish. Arrival day - We landed at noon and headed out to Robinson in the pangas about 1:45. We didn't see much there so Dean took The Rising Tide to Bluefield. Chuck got a couple shots, but that was it. Day 1 - Beautiful weather at Bluefield with 10-15 SE wind. I was with Noel and got around 15 shots with no luck. I did have a small one eat my fly without hooking up. Very frustrating after not getting any on the last trip either. In the last 17 days of fishing I've only gotten 1 permit. Dennis was with Dean and got one 7 lbs from the boat right before lunch. Chuck and Eddie didn't get one and neither Dennis or Chuck got very many shots so we moved to Sand Fly late afternoon. Day 2 - Beautiful weather at Sand Fly with 5-10 E wind. I got one 16 lbs with Dean while wading early morning and got a couple more good shots with no luck. Neither Dennis with Eddie or Chuck with Noel got very many shots, but Dennis had one eat his fly without hooking up. Late afternoon we moved to Blue Grounds. Day 3 - Beautiful weather at Blue Grounds with 5-15 E wind changing to NW and then to NE late afternoon. I got one 10 lbs early morning while wading with Eddie and then didn't get another decent shot until about 5 pm. Dennis with Noel only got a couple good shots. Chuck with Dean got around 15 good shots with no luck. Day 4 - Started out partly cloudy with 10-15 W wind then turned calm mid morning and ended with 10 E wind in the afternoon. I caught two with Noel, 7 lbs early morning while wading and one a little smaller mid morning from the boat. I only got 4 more shots the rest of the day for a total of 6 shots. Chuck also got two with Eddie both from the boat about the same size as my two and only had 3 shots all day. Dennis with Dean had 5 shots with no luck. Late afternoon we moved back to Sand Fly. Day 5 - Started cloudy with 15 W wind. No permit anywhere so we came back in for a couple hours. Late morning the wind died down and it became sunny. The wind changed to E 10-15 in the afternoon. I never got a shot all day with Dean. Chuck got 2 shots with Noel and had 3 eat his fly out of the same school, but didn't hook up. Afterward he realized the first permit had crushed the hook sideways against his fly. Dennis got 3 shots with Eddie and caught two, 20 and 10 lbs both from the boat. After he leadered the 20 lb permit, the rod broke as they were netting it and it got away so it wasn't weighed, but Eddie estimated it to be 20 lbs. They went back to The Rising Tide to get another rod, went back out and almost immediately caught the next one. Late afternoon we moved back to Robinson. Day 6 - Started cloudy with 10 W wind. Became calm and sunny midday and then 10 E wind in the afternoon. I was with Eddie and didn't get a shot until 3:30 and ended up with 3 shots. Chuck was with Dean and got 3 shots also. Dennis was with Noel and got 1 shot. No one had any luck. Day 7 - Started cloudy with 10-15 W wind. Became calm and sunny midday and 10-15 E wind late afternoon. I was with Noel and didn't get a shot until late afternoon and ended up with 5 shots. Chuck with Eddie only got 1 shot. Dennis was with Dean and got 5 shots and two hookups out of the same school, but both came off after a short time. Day 8 - Started cloudy with a 10-15 W wind. Became calm and sunny midday and 10-15 E wind late afternoon. I was with Dean. We stayed at Robinson all day and never got a shot. I never could imagine I would get no shots two times in a row fishing with Dean in nice weather. Pretty sure that will never happen again. Chuck with Noel and Dennis with Eddie both went to Sand Fly and fished their way back. Chuck got 5 shots and got one 6 lbs from the boat at Sand Fly. Dennis got 2 shots and got one 6 lbs from the boat at Bluefield. 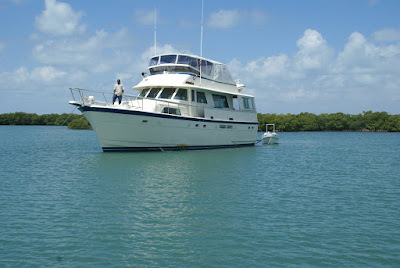 Moved The Rising Tide back to Belize City after we were done fishing. Departure Day - Our flight wasn't until 12:45 so Chuck and I went out with Eddie and Noel for a couple hours at Robinson. It started out cloudy with 15 E wind and the weather got worse as the morning went on. Neither of us saw anything. The guides were all great as usual and Radiance did a great job in the kitchen and on the boat. Eddie ended up with 6, Noel 3 and Dean 2. That's three trips in a row the Eddie has topped the guides with the most permit. Dennis and I each got 4 and Chuck got 3. Overall the fishing was extremely slow so we were happy to catch 11. We think the west wind in the morning, which is unusual, was keeping most the permit off the flats for the day. New permit totals for the group: Art 121, Dennis 64, and Chuck 6. So if this works for you, by all means let me know and we'll find you some appropriate dates. If a "dedicated permit" trip looks like a little too much and you would still like to do the Rising Tide in Belize... just not a dedicated permit trip, then let's talk. Lots of other itineraries available which include bonefish, tarpon, snook and yes, maybe even a few shots a permit!